Come on, guys… Don’t jinx me! I just know I’m going to manage a +10 on the 2nd round! -5…see…I had $10 on -7 x 2 for a -14 total! We know who is buying drinks in the clubhouse! Ha! One better than my score on each round. Nice one! So it was for BeachAV8R on #2 - sailing four balls in a row wide to the left side of the fairway, all dribbling down into the water, on his 235 yard approach shot to the green. He refused to be cowed by the hole, though he nervously eyed the diminishing number of balls in his bag. Finally making the shot, refusing against all common sense to take the easier drop near the hazard, he walked off #2 carding an 11. +1 for tawny. Or is that -1? @keets On the last course, good to see you in the running for a while there! LOL! For me, this Tropicana Resort course is just hard, hard, hard! Deceptive, because the driving and approaches are easy, but the skill required for the putting is way beyond my putrid ability with the putter. I feel like I am trying to put into a hole at the top of an anthill most of the time! Oh joy… something to look forward to. I’m finding the putting challenging, particularly if there is a horizontal break. I can’t remember the exact words the commentator says, surprising because I hear it so often, but it’s something like “oh, so close, I thought that was in”. It makes me want to go round to his virtual commentary box and hit his virtual head with my virtual putter. I’ll try and get a round in tonight, I predict I’ll be propping up the leaderboard. You can turn that buffoon off by lowering his volume to 0. Your life will improve instantly. It all started so well. The greens weren’t quite as bad as I expected and was sitting at a respectable +2 at the turn. 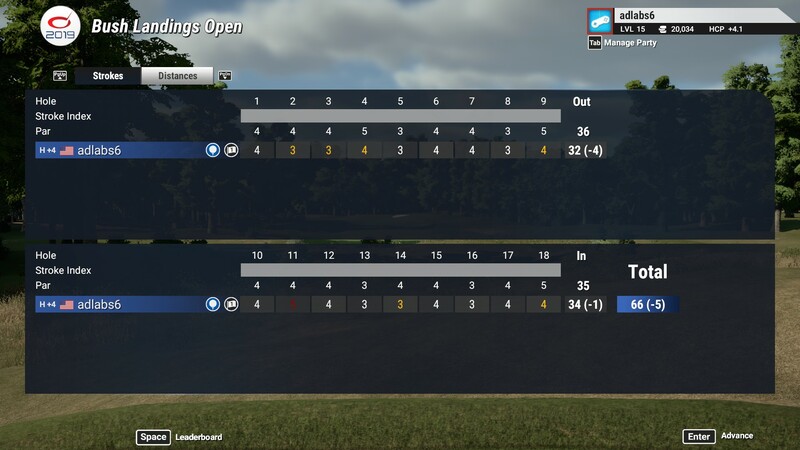 An horrendous back nine and I finished up 14 over. Ugly ugly golf. What a course. I can’t recall ever having so many shots in a single course before. Shots bouncing off of rocks. Shots into bunkers that rolled out of the sand and… onto the fairway!? Putt 12 feet to pin, ball stops just short, rolls back 12 feet. I swear I just pick these from the high rated and popular lists lol. No - I love them! Clearly high rated and popular also means quirky and challenging…which is great. I like a little bit of mental exercise while I’m playing… You are doing a great job. There will be a little extra in your Country Club Management fee this month…! I’ll add the two you’ve posted. We’ve already played the others. People add more courses to that thread I’m happy to put them in the rotation. I’m hoping to get a major in and then the bug finale for the season and we’ll start another season shortly after. If people have suggestions for how they want it run I’m game. If you’re happy with how things are now, as in mostly random, mix of free and non-free entries… That works for me too. Pretty low maintenance. Yea @Rhinosaurus no way am I knocking the course choice. Just mentioning that it presented me with a fair few odd shots (which I must say… most of them worked out OK, but IRL should never have, lol!). I enjoy seeing the sights, so to speak, in this game. Courses I’ve not played, or may otherwise not have ever played. I don’t often pick and play courses that aren’t on my PGA tour, so yea… I’d miss a ton of these courses. Saghen, thanks for the reminder on that post. I’ll remember to add to it. EDIT: And yea, I’m quite pleased with how the current events are setup/going. I love the clown courses. LOL. Some of the greens on Tropicana were wild. It was fun to try to put the ball in a spot on the green that would allow it to trickle down to where you wanted it. Fun stuff.